MANILA, Philippines – Only two weeks after the Supreme Court allowed Senator Grace Poe to run for president, an unseated district representative lamented what she called the “double standard” of the high tribunal in handling disqualification cases in lower elective posts in the Philippines. Regina Ongsiako-Reyes is the first poll protester to invoke the controversial ruling on her own eligibility as representative of Marinduque province’s lone district. In 2013, the Commission on Elections (Comelec) annulled her proclamation as the winning candidate since she lacked the one-year residency requirement for elected officials. Reyes pointed out that her and Poe both faced disqualifications before the high court. The only difference, she said, was that she, “a natural-born citizen with a birth certificate, whose parents are Filipino citizens, and are known public servants” was ruled ineligible to serve as district representative. 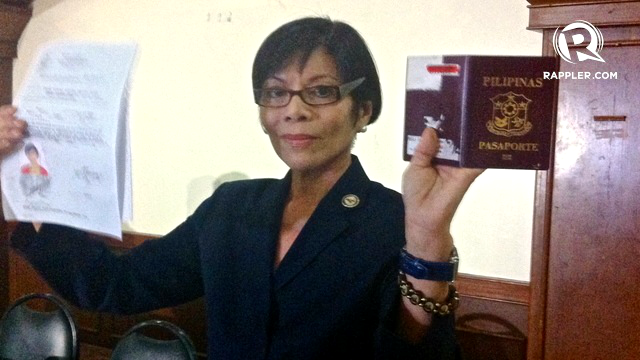 She added that, like Poe, she also executed an affidavit renouncing her foreign citizenship twice – on September 21, 2012 and on September 21, 2015 – which restored her status as a natural-born Filipino citizen. With a little over two months before the May polls, Reyes said she will raise these arguments as she asks the SC to revisit her case. "If Poe is allowed to run, should not, with more reason that Gina O. Reyes be allowed to run?" she said. In a landmark ruling released on March 8, 9 SC justices voted in favor of reversing the decision of the Commission on Elections (Comelec) to cancel Poe's certificate of candidacy – allowing her to join the presidential race.